Today I am happy to announce a small application I developed recently using latest Visual Studio 2012 Express which is free from Microsoft. Although known with my work on Java in the community, I am pretty open to any programming languages and tools that are best to get work done. This time it happens to be C# and .NET. I started the tiny application for myself, but thought others may be interested as well thus worthwhile to share it here. It’s the first project for end users (administrators) after developer-oriented projects like VI(vSphere) Java API and DoubleCloud Proxy(intercepts SOAP messages to vSphere and generates Java code for automation). The application is essentially a wrapper around a Web browser so that the user experience is similar to a standalone application. As you’ll find out, this is not limited to vSphere Web Client but also other Web based GUIs like vCloud Director, vFabric App Director, and other Web application that is nothing to do with VMware. If you happen to close vSphere Web Client, you will get a dialog box for confirmation. As a result, you won’t incidentally close your vSphere Web Client any more. Below is a screen shot of the application. As you can see, this little application has another nice feature that can make your life easier. 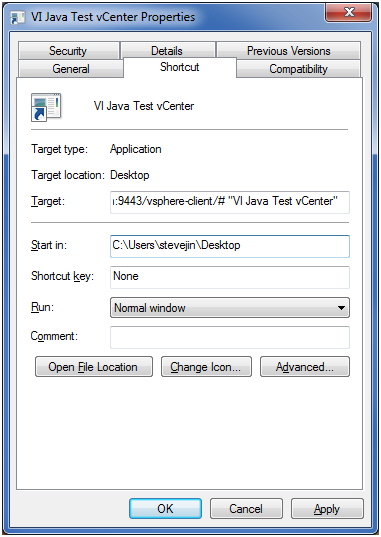 While working on any screen of the vSphere Web Client, you can create a shortcut on your desktop with one click. The shortcut, once clicked later, opens up the exact screen when shortcut was previously created. In some way, you can think of it as a screen snapshot of vSphere Web Client. If you have a particular page to look for in vSphere Web Client, a shortcut would be really handy. 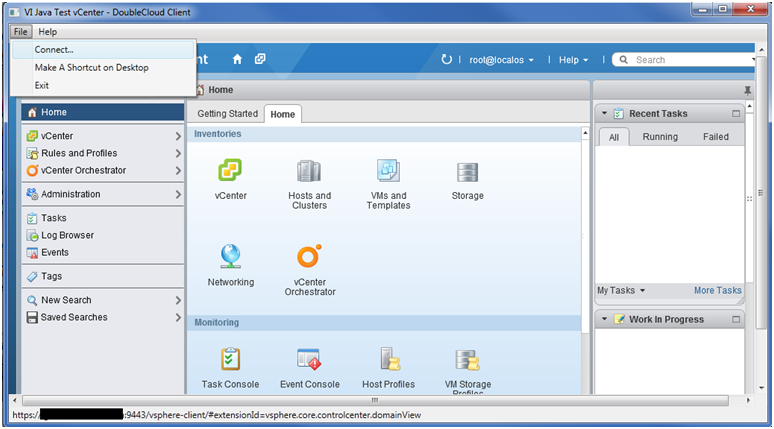 For example, if you are most interested in networking or one particular host, you can create a shortcut while the particular screen is visible in vSphere Web Client. Yours will be different for sure, but you got the idea. When you create a desktop shortcut, the first two are already there for you. All you need to do is to add alias if you want to. I would suggest you do that because the long and sometime weird URL will be on the title. There are other options you can do with the shortcut, for example, change the name of the shortcut; change the icon of the shortcut, etc. Since these are standard Windows feature, I would leave it to you to explore. Update: A new feature that keeps session always live is added in latest version. More details are here. Having read this far, it’s time to download and play with it. It’s just around 16.5K (not M or G). Should you have any comment/feature request, please add to the comment. As with any other software, the risk is yours and I am not liable for anything even though I’ve tried best to develop and test it. If you agree on that, please go ahead and download it *HERE* and place it on your desktop (no installer is needed – click on it and it will run); otherwise, please skip this. Note: if your vCenter server certificate is self signed as normal, you may see an error message with a refresh link. Just click the refresh link, the issue will be gone. I haven’t yet found a good way to get the error notification and reload it programmatically. For feature release annoucements, please feel free to follow me on Twitter (@sjin2008) and sign up the newsletter. Glad you like it. Do you want to elaborate a bit more? Currently you can include a page as default with command line. Good to know that. On your command line, you can pass in URL to your Web Client as the first argument. There is a sample below the second screen shot of creating shortcut. Good luck! I only get the option to re-install plugins in the DoubleCloud client while in all other non-wrapped browsers they are already installed and working. When I chose reinstall I only get the option to repair etc since they are already installed. Sorry for the issues. Behind the scene, it’s really IE control embedded in a standalone application. I need to look into the plugin issue when I have time. Thanks! Hi! Love your tool! Very quick compared to the regular web client! The only problem I have with the app is that I’m unable to download the Client Integration Plugin! When I click CIP it tries to download it from localhost and then it fails. I even turned off the IE protected mode and tried but it gives the same problem. Can you please help me if you have time! I really need this program to work! Love your App! Please help me! thanx! Thanks Siva, I am glad you like it. What if you use normal Web Client to download the CIP and then try the tool? Free tools for VMware Infrastructure | Go Virtual.